Wilbur Glenn – President, Royal Crown Cola Corp. International. James Carmichael – Owner - RC Cola Bottling Company Memphis & Mobile. Charles Trimmier – Mayor of Mobile, Alabama. Art Linkletter – TV Personality and Member of Board - RC Cola Corp.
Tom Ballinger –V.P. & GM of RC Cola Bottling Co. – Mobile. Little did I know at “this time of my defamation by Mr. Carmichael” that the Lord Jesus Christ moved me out of Stage III as being one of the many CALLED and on to Stage IV as having become one of the few to be CHOSEN─FOR MANY ARE CALLED, BUT FEW ARE CHOSEN. But time and chance happens to all men; none of us know when our hour will come (Ecclesiastes 9:11-12). The Lord moved me along—time went by like a mighty flight of eagles. To my knowledge, I had not ever experienced any Satanic opposition until James Carmichael launched his malicious hostility. By comparison to him, I was an insignificant “nobody.” I did nothing to harm him. By hard work and the Grace of God, I put his Mobile business on the map as a shining example of how RC Cola could rank second only to Coca Cola in the Southern States. We replaced Pepsi Cola from being number two in the Mobile Market. Despite this accomplishment, becoming a Christian overshadowed my work-place performance as far as Mr. Carmichael was concerned. He seemed to be determined on doing harm to me with his untruthful accusation of me being “a Religious Fanatic!” He asked me to resign. I would never stay where I was not wanted. I contacted on old friend, Les Helms, an RC Cola VP Division Manager on the West Coast to have him notify Art Linkletter to see if Art was still interested in hiring me to manage the Oakland RC plant he was purchasing. Les got back with me in a couple of days and told me, at this time, it wasn’t a possibility. 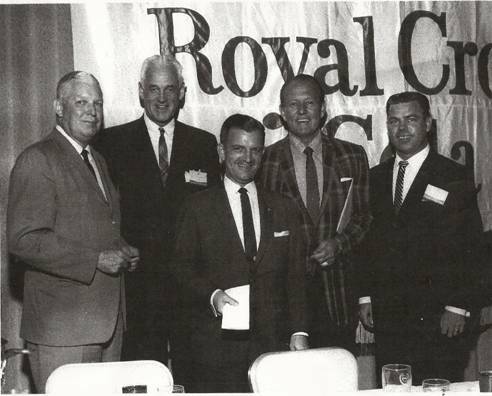 It was because I was a “hot potato.” The Royal Crown Cola folks said they needed to let Mr. Carmichael cool-off. He was still insisting the RC people shouldn’t help me. I wondered, “What had I done to this man that would make him so vengeful?” He seemed to be inspired by the prince of darkness to ruin me. But, then, I thought, “Maybe the Lord has something else in store for me which would be far better. He did. But, my “time and chance” would be fifteen months later. Two months after I left the employment of Mobile’s R.C Cola, I received a telephone call from Mr. Leonard Green. He lived in Dallas. Mr. Green had been the President of The Texas Company (aka Texaco) for a number of years. He left Texaco to become President of the Dr Pepper Company. He was Dr Pepper’s President when I joined Dr Pepper Company as one of their Zone Managers. After I left Dr Pepper, I lost track of him. But, it was evident that he had not lost track of me. Just before I ran out of my two months supply of money, I got a phone call from Mr. Green. He renewed his acquaintance with me. Mr. Green informed me that he and his business partner bought the Dr Pepper Bottling Company in Roanoke, Virginia. Roanoke was the most successful Dr Pepper plant in America. This bottling operation was founded by an East Texan by the name of Bill Davis. Bill Davis was Legendary in the soft drink business. As a Zone Manager, I cataloged every story I heard about Bill Davis and the way he ran his bottling plant. I learned most all of his trade-mark methods and techniques that set Roanoke in a league all by itself. Roanoke consistently ranked Number One with the highest per capita consumption of Dr Pepper in the U.S.A. The [Dr Pepper] company sells more Dr Pepper in the Roanoke Valley area of Virginia than any other metropolitan area east of the Mississippi River… John William "Bill" Davis opened the first Dr. Pepper plant east of the Mississippi in Roanoke in 1936; subsequently the city was named the "Dr Pepper Capital of the World" and broke world records for its mass consumption of Dr Pepper in the late 1950s. Dr Pepper donated a portion of its sales revenue in the Roanoke area to finance restoration of a circa-1950s neon Dr Pepper sign, which has the company's "10–2–4" logo from the time, in downtown Roanoke. In October 2015, the city of Roanoke declared October 24 (10-2-4) to be its official Dr. Pepper Day. Leonard Green and his partner, Ed Hoffman, hired me to be their Sales Manager in Roanoke—they saw through the flimsy allegations that I was a “Religious Fanatic.” Mr. Green was a “Class Act.” Nothing was ever mentioned concerning me leaving RC Cola in Mobile. I am sure Mr. Green knew of the rumor that had been spread, but evidently, his sources told him it was a “bunch of baloney.” That was what a person who was “in the know” told me. Mr. Bill Davis still maintained an office in the Roanoke Bottling Plant. I was privileged to see him frequently. I later learned that Mr. Green and Mr. Hoffman were in negotiations to buy the Coca Cola Bottling Co. in Spartanburg, South Carolina. I was told that if the Coca Cola plant was purchased, I would probably be offered the job as its General Manager. I stepped right in and held the morning Sales Meetings as I did in Mobile. It was the way I was told Bill Davis used to do back in the 1930s. I did not close the meetings with a Word of Prayer. I was not in the position to change their way of doing things. I did not have the authority to modify their established procedures. My job as the Sales Manager of the leading and outstanding Dr Pepper Bottling Company in this country was to manage the sales organization which produced the highest Per-Capita consumption of Dr Pepper on record. My Christian endeavors continued. I was an active member in CBMC in Roanoke—Christian Business Men’s Connection, as I had been in Mobile. I spoke a number of times at Roanoke’s Rescue Mission. Gloria and I joined a Mid-Acts Church. It just so happened that the pastor knew Dr. Henry Grube (our pastor and friend in Mobile). I had dozens of reels of Dr. Peter Ruckman’s audio tapes. A lot of my free time was spent transcribing Bro. Pete’s tapes into three-ring binders. He was a Baptist, not a Dispensationalist, and I learned how to disregard things contrary to my beliefs of rightly dividing the Word of Truth. But, I learned from his teachings how “to handle the Bible”—with great respect and awe! During the fifteen months I worked at Dr Pepper in Roanoke, my learning experience was really expanded. I learned what I considered Advanced Management Skills from several men who had grown up under the tutelage of the legendary Bill Davis. The icing-on-the-cake was that Mr. Davis still maintained his Office in the bottling plant. This afforded me the opportunity to observe him and ask pertinent management questions. I feel a few comments concerning Mr. Davis are appropriate. He was on the Board of Directors of the Dr Pepper Company. He held the Frito Franchise for the Washington D.C. area. He built the Frito business in D.C as he did his Soft Drink business in the Roanoke Valley of Virginia. Frito put him on their Board of Directors. He had already become a Bottler of the soft drink named Mountain Dew. Mt. Dew was carried on our Dr Pepper fleet of trucks. Mr. Davis’ ownership of stock in the Frito Company was enhanced when Frito bought the Lay Potato Chip Company of Atlanta, Georgia. Frito became The Frito-Lay Corporation and Bill Davis became the largest stock holder in the new Corporation. Later, the Pepsi Cola Company bought out Frito-Lay—this buy-out added greatly to the wealth of John William “Bill” Davis. Pepsico later obtained Lipton Tea, Tropicana Juices, Gatorade, Quaker Oats, Pizza Hut and many more. Add to these an incident before Frito bought-out Lay Potato Chip, there occurred an unheard-of business arrangement. The Frito franchisee for Puerto Rico was in serious financial straits. To shorten a long story, the Frito Corporation called on the one-and-only, Bill Davis, to be the “Fireman” to put out the financial fires in Puerto Rico. They offered Mr. Davis the Franchise for Puerto Rico at no cost if he would take over the Frito operations. Bill Davis spent six weeks in Puerto Rico running the operation as if it were his. He found a Cuban, by the name of Pepe, in South Florida and took him to Puerto Rico. Pepe followed Mr. Davis’ instructions. Mr. Davis didn’t speak Spanish. Pepe translated for him. Mr. Davis was given six weeks to determine if he wanted to accept the challenge. He took the challenge and made Pepe his manager. It worked out just fine. Bill Davis didn’t know how to pronounce “Pepe.” He called Pepe—“PeePee.” That became Pepe’s name. I don’t know the rest of the story. About the time the deal was finalized, I left Roanoke to return to Mobile, Alabama and work with Murry Evans who owned and operated two Burger Kings. After an enjoyable fifteen months as the Sales Manager of Dr Pepper in Roanoke, I received a telephone call from Murry Evans, my friend in Mobile. He said he would like to fly up to Roanoke and visit with me. The Obstacle Course I had been on in Mobile, Alabama had gotten progressively arduous because of Mr. Carmichael. The Road to Glory smoothed out while I was in Roanoke. There was a definite respite during my time there. Murry and I visited with each other the greater part of a day. He had told me over the phone he wanted to talk about me joining him in managing his Burger Kings. I thought to myself, how can two grown men make a living selling hamburgers—little did I know. I prayed that if Murry said anything that even caused me to doubt even the slightest bit, I was to consider that to be a sign from the Lord Jesus not to accept his offer. We discussed his offer most of the day. He also informed me of a Mobile Youth Ministry he had started the previous year—The Mobile Youth Ranch. It was non-denominational and designed for High School kids. Junior High students also attended. The kids would play Volleyball to begin with and after an hour or so, go into the meeting room and have a Sing-Song. Murry and a couple of adults played the guitar and the washtub that was mounted with a broomstick with a rope attached to it. It was played like a bass fiddle. Ray Gockley, as I recalled, led the group in singing folk songs and, then, he led them in good, lively gospel songs, followed by serious hymns (This was based on my recollections as I observed several times). Murry spoke and presented the Plan of Salvation and gave an invitation. The “Ranch” ministry led untold numbers of kids to Christ. I found it to be an amazing ministry. The Mobile Alabama Church World stood in awe at the number of kids from their churches who were getting saved and becoming active witnesses for the Lord Jesus Christ. I drove Murry to Roanoke’s airport. We said our goodbyes outside between the Ticketing Building and tarmac. It was a beautiful day, and the outside was packed with passengers. Murry shook my hand and said, “Let’s have a word of prayer.” Still holding our hand-shake posture, we bowed our heads, and Murry began to pray unashamedly out-loud in the presence of all the passengers. As Murry prayed, I became acutely aware that Murry had not said a single thing that I could have classed as a sign from the Lord to refuse this offer. We were together most of the day and not one word was unlikable. I was to call him in a day or two to let him know if I would accept his offer. I accepted the invitation Murry gave me to become a business partner with him. Our agreement was simple. I was to manage the operations of the Burger Kings. Of course, this was to be under his direction. Over time, Murry’s responsibilities revolved into concentrating on the expansion of our Burger King Restaurants. He had a keen eye for finding quality locations. On top of this, he had a gift for securing bank loans for our expansion. The Lord really gave him the aptitude of connecting with the Loan Officers. I had seen him get a commitment for a loan from a bank on his very first time we visited a city in which we had no ties. The only link was that Burger King Corp. had approved him to be a franchisee for that city. I sat in on most of his meetings with bankers. There were times that I sat in observing, with amazement, at how Murry handled himself in such a manner that I sensed that the banker wanted to help Murry secure the loan. Most Loan Officers “had glass eyes” meaning they were not susceptible to revealing their emotions. Murry Evans could tap into “glass eyes” and get them to drop their “Loan Officer” demeanor. As our business began to grow, and the Lord began to open doors of ministry, we became “true yokefellows and fellowlaborers” (Phil. 4:3). I considered this to be the Lord Jesus directing and overseeing our witness. As I reviewed our past, I now see this as he and I being “knit together.” This was our testimony to having been numbered among the “Few,” only to move into Stage IV as ones who the Lord Jesus CHOSE. “Till we all come in the unity of the faith, and of the knowledge of the Son of God, unto a perfect man, unto the measure of the stature of the fulness of Christ:” (Eph. 4:13). We will come into this “Perfect Man” position when 2 Timothy 4:1 and Titus 2:13 becomes a reality. In conclusion, it must be noted, emphasized, and underscored that James H. Carmichael’s action against me, declaring that “Tom Ballinger is a Religious Fanatic; he cannot be depended on” was totally uncalled for. * My Lord and Savior gave me a bona fide friend--Mr. Murry J. Evans. * I led many to the saving knowledge of Jesus Christ. * I preached many messages to convicts in the Mobile County Jail. * Taught the Bible in Greystone’s Sunday School for Adults. * Taught Thursday Night Bible Classes at The Youth Ranch facilities. * The new Pastor at Greystone didn’t like me and Murry’s attendance because of our ministry which was non-related to Greystone Church/ we left as did a number of others. * A daily radio program was started, “The Present Truth Radio Broadcast.” We taught right division. I had a Daily 15 minute broadcast and Murry had a Saturday morning 30 minute broadcast. * Murry and I bought property for the Berean Chapel in Mobile. A brick home was remodeled and a Chapel added to the side of the home. * I was invited to teach at various at Acts 28 Bible Conferences across the USA. * Started the Acts 28 Gulf Coast Bible Conferences at the Mobile Berean Chapel. Bible Teachers from all over the USA as well as England were invited to teach God’s Word at our Bible Conferences.